The UPF commands are, in general, transitive in nature. For example, for any given instance included in a power domain, all child instances of that given instance are transitively included in the power domain, unless any child instance is explicitly excluded from this particular power domain or is explicitly included in the definition of another power domain. This explicit exclusion or inclusion from the ultimate instance list is strongly and precisely defined in the UPF LRM as effective_elements_list because it influences the construction of design (DUT or HDL) objects into UPF objects. So the effective elements and the transitive nature of UPF commands are laterally related. However, none of these exclusion or inclusion element lists are actual UPF commands. Although some commands do have explicit -transitive <TRUE | FALSE> as an option, for many other commands it is implied in the semantics — specifically, for denoting power domain extents through instances or through lists of ports to apply strategies with -elements or to exclude some part of the design with -exclude_elements. It may also be implied for model names in specifying a list of models to attributes with -models, library name to specify all models with -lib, etc. 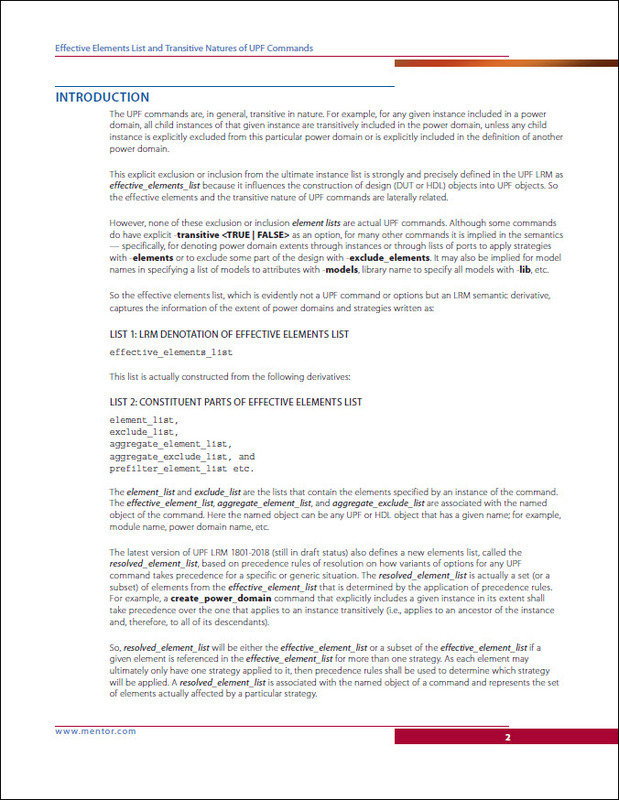 Read the entire Effective Elements List and Transitive Natures of UPF Commands technical paper.